In recent years, I have had the privilege of praying at a variety of events at the State Capitol. Most have been traditional services, like the National Day of Prayer held on the first Thursday in May. Others have been in more private settings with individual lawmakers and staffers who work at the State Capitol. But I have to say I have never had the privilege of praying at an event quite like the “Keep Faith in America” service held Jan. 17 in The Rotunda of the State Capitol. What made this service so unique is that it was initiated and conducted by members of the House and Senate. About a dozen came together to lead in committing themselves to prayer while urging constituents to join them. While their tribe was not that numerically large at the service, in reality, it is considerably larger because many others had legislative commitments to keep. I have been saying for the past few years that the number of faithful Christians serving our state has steadily climbed. Several groups hold regular prayer meetings at the Capitol, but to my knowledge this is the first initiated by lawmakers. The prayer service was one of 30 “Keep Faith in America” prayer services across the country. The “Keep Faith in America” movement comes in response to what many see as a moral and cultural slide in America. The mission is simple: federal and state government leaders joining together at capitols across the country to lead in praying and advancing the unifying message around faith, freedom, civility and prayer. I want you to know the names of your elected lawmakers who participated in such an important service: Sen. Ed Emory (R-Lamar), Sen. Wayne Wallingford (R-Cape Girardeau), Sen. Mike Cunningham (R-Rogersville), Sen. Caleb Rowden (R-Columbia), Sen. Jeannie Riddle (R-Fulton), Sen. Andrew Koenig (R-Manchester), Rep. Mike Moon (R-Ash Grove), Rep. Charlie Davis (R-Joplin), Rep. Randy Pietzman (R-Troy), Rep. Bill Kidd (R-Independence), Rep. Tim Remole (R-Excello), and Rep. Allen Andrews, (R-Grant City). I was asked to testify before the Senate’s Health and Children’s Committee Jan. 17, in support of Senate Bill 610. If passed, it would withhold Supplemental Nutrition Assistance Program (SNAP) funds from deadbeat parents until they are current with their child-support payments, said Sen. Denny Hoskins, (R-Warrensburg). Parents who refuse to do the right thing and support their children should not be able to extract money from taxpayers’ pockets, he added. I agree. We should not be subsidizing the lifestyles of deadbeat parents if they are not making a good-faith effort to provide their children with support. This legislation will help children and custodial parents by encouraging more deadbeat parents to do the right thing and pay what they owe. I pointed out to the committee that about 500,000 Missourians suffer from malnutrition – about one-third of them children. This bill should help alleviate their suffering and I thanked the committee for letting me speak in behalf of Missouri’s innocent children. 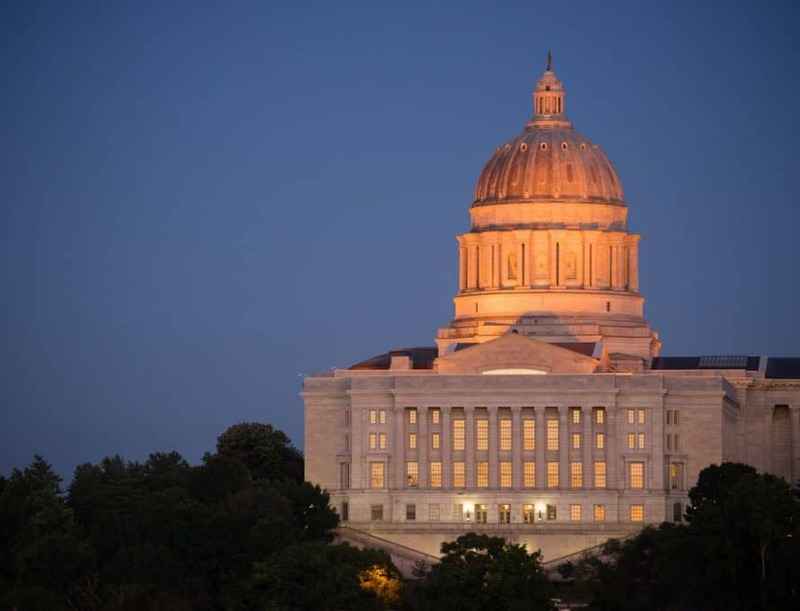 In less than three minutes of debate on Jan. 17, the Missouri House of Representatives overwhelmingly passed a bill aimed at curbing human trafficking in Missouri. It requires posters be placed in prominent locations across the state, explaining the crime of trafficking and displaying a national resource center hotline. “It’s been shown that when victims use hotline numbers they have a better chance of being rescued,” said Rep. Patricia Pike, (R-Adrian), the bill’s sponsor. Missouri had 74 reported cases of human trafficking in fiscal year 2017. There have been more than 200 cases reported in the past two years. Missouri ranks 20th in the nation in reported cases, while Kansas City is among cities with the greatest number of cases, some involving prostitution rings while others involve immigrants, traveling across state lines, forced into labor. A more recent, disturbing trend, is the sexual abuse of young boys. Last year Attorney General Joshua Hawley announced the permanent formation of a Human Trafficking Task Force. Hawley is also pursuing new regulations under the state’s consumer protection laws. The regulations prohibit the use of businesses in human trafficking, establish new civil and criminal penalties for traffickers and make it against the law to force someone into labor. Let’s pray the Senate acts quickly on this common-sense bill and sends it immediately to Gov. Eric Greitens to sign into law. Remember, we can all help. If you see something that does not look right, report it. The hotline for the National Human Trafficking Resource Center is 1-888-373-7888.